Before you specify settings for a Microsoft Hyper-V host, you must rescan volumes of the added host. During volume rescan, Veeam Backup & Replication retrieves information about disks and volumes that are currently connected to the Microsoft Hyper-V host and writes this information to the configuration database. In the working area, select the host and click Rescan on the ribbon. Alternatively, you can right-click the host and select Rescan. By default, Veeam Backup & Replication uses changed block tracking for processing Microsoft Hyper-V VMs. You can disable changed block tracking, for example, for testing purposes. Change block tracking is enabled and disabled at the level of the Microsoft Hyper-V host. The Disable changed block tracking for this host setting does not apply to Microsoft Hyper-V Server 2016 and later. In the working area, select the host and click Manage Volumes on the ribbon. Alternatively, you can right-click the host and select Manage Volumes. You can define volume-specific settings for a Microsoft Hyper-V host: select what VSS provider must be used for snapshot creation and specify the maximum number of concurrent snapshots that must exist for the volume. Select the volume in the list and click Edit. [For Microsoft Hyper-V 2012 R2 and earlier] To take a VSS snapshot of a specific volume, Veeam Backup & Replication uses one of VSS providers available for this volume. 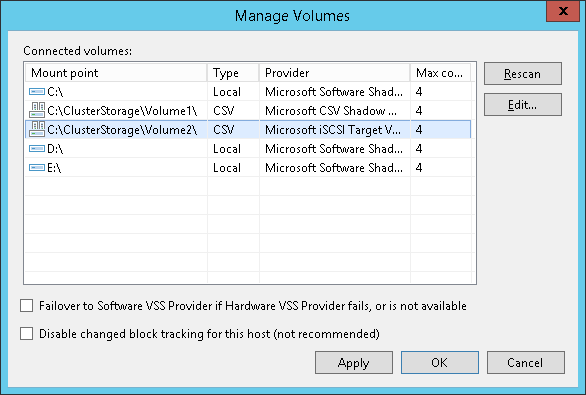 To explicitly define what VSS provider must be used for the volume, select the VSS provider from the VSS provider list. If a VSS provider is not set explicitly, Veeam Backup & Replication will scan the list of available VSS providers and select the most appropriate one automatically. By default, jobs working with the same volume can take up to 4 snapshots of the volume simultaneously. If necessary, you can increase or decrease the number of snapshots that can exist at the same time. It is not recommended that you increase the number of snapshots for slow storage. A great number of snapshots existing at the same time may cause VM processing failures. For VMs hosted on Microsoft Hyper-V Server 2016 and later, the Max snapshots value defines the maximum number of checkpoints that may be retained for a processed VM. The setting is specified at the level of a volume on which VM disks reside. If you have selected to use a hardware VSS provider, Veeam Backup & Replication uses the specified hardware VSS provider for volume snapshot creation. 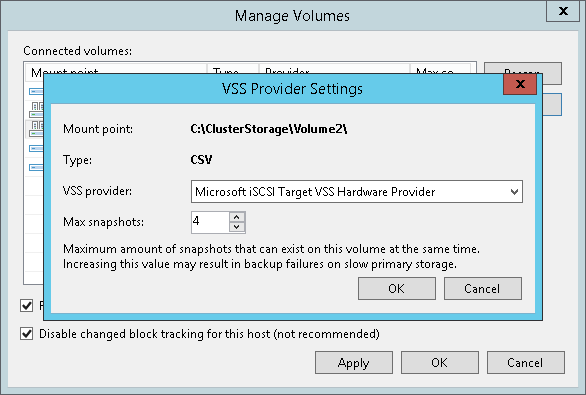 If the hardware VSS provider does not manage to create a volume snapshot for some reason, Veeam Backup & Replication automatically fails over to a software VSS provider. 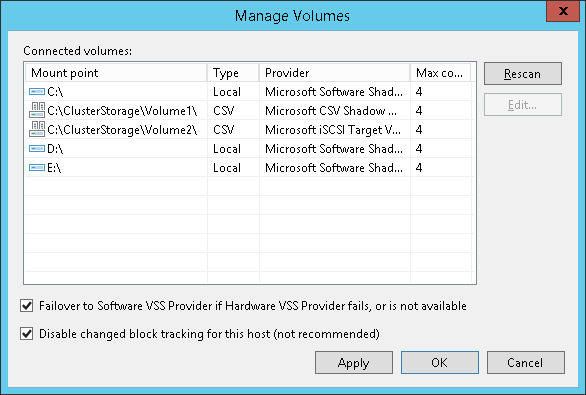 In the Manage Volumes window, clear the Failover to Software VSS Provider if Hardware VSS Provider fails, or is not available check box.